Fans of shiny flagship ultrabooks will be pleased to hear that Japan-based tech heavyweight Toshiba is bringing its premium Kira line to Europe for the first time. First outed in the US and Japan back in May 2013, the Windows 8.1-powered Kira ultrabook is due to go on sale in the UK, France and Germany during the first quarter of 2014. Kira translates to 'glitter' in its maker's native tongue, a name likely chosen in reflection of the machine's dazzling 13.3-inch PixelPure display, which totes a super-sharp 2560 x 1440 pixel resolution. With 221ppi, the panel offers one of the highest pixel densities on any Windows laptop and is only narrowly bested by Google's Chromebook Pixel (239ppi) and Apple's 13-inch MacBook Pro with Retina (227ppi). The display also features 10-point touch and is toughened up thanks to the presence of Corning Concore glass. Under the hood is an Intel Core i7 CPU with integrated Intel HD 4400 graphics, a 256GB SSD and 8GB of RAM. On the connectivity front there's three USB 3.0 ports, HDMI out for connecting it to a larger display and a full-size SD Card reader. Battery life lasts up to nine hours thanks to the inclusion of Intel's battery life-extending Haswell architecture, according to Toshiba. 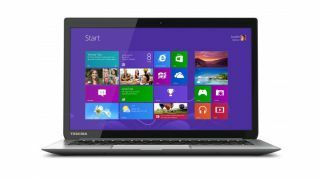 What are the best ultrabooks available today?